[16:30:12] <psha> what branch is with latest userfuncs code? [17:22:22] <mhaberler> well, if a user does it in the class __init__ thats dumb..
[17:25:46] <mhaberler> well, one could delay connecting signals to later ..
[17:47:30] <mhaberler> the hal_widgets stuff is more relevant, I can do simple stuff like optionparser..
[17:48:06] <psha> you need another gprop? [17:50:04] <mhaberler> group... dunno - I want to havee a prop in HAL widget (those where it makes sense) - boolean 'persistent' settable in glade and readable at runtiime. Dont know the glade speak..
[17:50:49] <psha> why not to dump all and then resotore all? [18:03:32] <mhaberler> anyway, gotta run; bb later! [20:58:28] <jepler> psha: what's up? [21:06:24] <psha> or in glcanon? [21:07:13] <jepler> but python of course doesn't complain when asked to compare a number and a string for equality..
[21:09:29] <jepler> did you fix this locally? [21:12:48] <jepler> this improves the dimensions display but ideally it would return the actual view of the moment..
[21:13:48] <psha> but is it possible to set correct view mode from lat/lon on expose event? 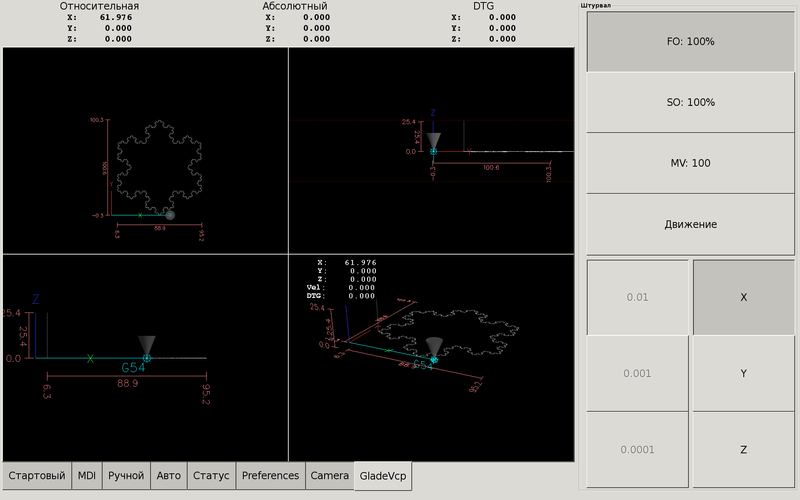 [21:14:33] <psha> i've looked at set_viewangle function on glnav but is it doing all needed transformations? [21:16:44] <Jymmm> cradek: why's that? [21:17:54] <jepler> psha: OK, I'll push the get_display_alpha fix and the get_view "fix" to master..
[21:18:03] <jepler> wow gremlin updates a ton faster than axis! [21:19:40] <jepler> hm, I have a bunch of debug spew on my terminal. I wonder what it's from. [21:22:07] <cradek> just need to run configure? [22:28:51] <jepler> psha: in your app or in gremlin.py minimally modified like I did earlier? [23:11:05] <jepler> not that I care whether any software I write has a hope of running on windows! [23:12:54] <psha> jepler: btw why there are two additional gl commands in set_view_x in axis? [23:13:47] <psha> how many users of set_view_x in emc? [23:14:18] <psha> maybe it's better to move this Magick Code (tm) into glnav directly? [23:20:02] <mhaberler> psha: hal_init() is history, all done through hanlder's__init__() including hal pins. a tiny reshuffle in gladevcp. [23:23:16] <jepler> psha: remember to quit *before* the sun comes up, eh? [23:26:46] <andypugh> jepler, could you spare a minute? [23:34:00] <SWPadnos> just to ask a silly question - can you still compile gearchange.comp? [23:38:29] <andypugh> SWPadnos: Is there an option to create docs or not? That might be the issue. [23:39:25] <SWPadnos> have you changed the doc strings in gearchange since the last time it worked? [23:39:35] <andypugh> Hmm, I definitely get the out-of-date docs. [23:39:49] <andypugh> Looks like a problem with my doc formatting then. [23:45:14] <andypugh> Other than closing all the quotes correctly I am stumped as to what could be wrong. [23:47:52] <SWPadnos> I don't know if you can put " characters inside a "normal" string, ie one delineated by single " instead of triple "